This book was first published in 1929 and it’s another Inspector Alan Grant mystery. I read Tey’s Daughter of Time recently and I thought that it was really good but I liked this one even more. It just absolutely hit the right spot for me at the moment. It’s also far better than The Franchise Affair which always seems to be the one which people are recommended to read. It’s set in London to begin with and a man has been knifed in the back whilst he was standing in a theatre queue. There’s such a crush that he is dead for some time before he falls down as the crowd had kept his body upright. Nobody else in the queue had noticed anything unusual and the body has nothing on it which would help to identify it. Bit by bit Inspector Grant uncovers his identity and the action switches to the Highlands of Scotland and a man-hunt which is every bit as good as any written by John Buchan. This kept me guessing all the way to the end and I can’t say that about all mysteries. So if you enjoy vintage crime books you should definitely give this one a go. The only other thing that I have to say is that the word Dago is used prolifically throughout The Man in the Queue – describing a man of dark Mediterranean appearance. In 1929 this was regarded as normal I suppose but its definitely un-PC now. Mind you I did read somewhere that Spanish/Italian people didn’t regard the word Dago as derogatory as it’s a corruption of the name Diego and so as far as they are concerned it’s just the same as being called Jimmy. I don’t know if that’s true or not though. Josephine Tey was of course a Scottish writer and not English as I read recently on another blog. She was born in Inverness and taught in various schools in Scotland and England but moved back to the Highlands to look after her father and continued to write there. 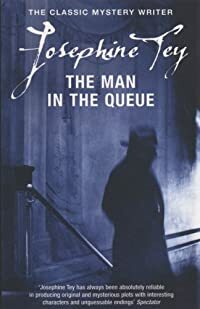 This entry was posted in Books and tagged classic mystery, Josephine Tey, Scottish author, The Man in the Queue, vintage crime by Katrina. Bookmark the permalink. It seems like several people have been talking about Daughter of Time lately and for soem reason I thought Tey was young and contemporary. Guess not. How nice to know she has other good books too. Tey was born in 1896 and died in 1952. I think we read The Franchise Affair in 1st year of high school but it isn’t my favourite. I’ve really enjoyed her other books though. I will have to read this one. I really liked Daughter of Time, and if this one is better, I’m all over it. I hope that you really enjoy it when you get around to it. I’ll look forward to reading your thought on The Man in the Queue!